An IntelliJ plugin to query Stack Overflow. StackInTheFlow integrates seamlessly with Intellij to allow you to find the solutions to the development problems you face without ever leaving the flow of your development environment. Take your automation one step further by having StackInTheFlow generate queries for you. Either generate a query from an editor tab or select a block of code, then right-click and select Auto Query! If enabled, StackInTheFlow with make suggestions of Stack Overflow articles when it thinks they will help you out with your current task, ensuring relevant information is always at your fingertips. 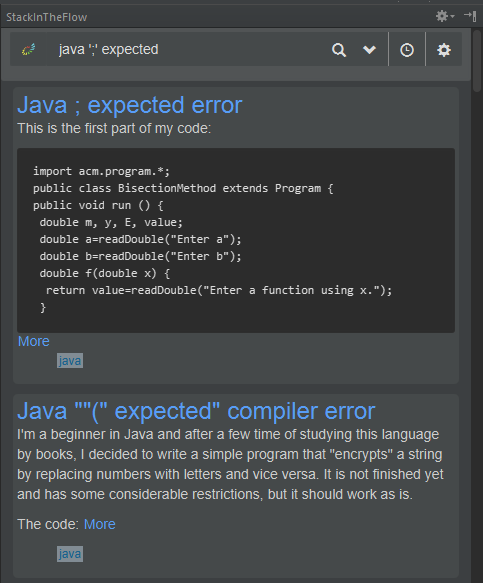 Never manually search for the meaning behind a cryptic error message again! Refine your searches by sorting by different metrics and filtering by specific tags. If you never want to leave the comfort of your keyboard, you can even press <TAB> to add the previous word as a tag. The plugin can be downloaded via the StackInTheFlow Intellij plugin page or the in-IDE plugin browser. StackInTheFlow is compatible with Intellij 2016.2 and later. The source of StackInTheFlow is available on GitHub. Browse other questions tagged app stackoverflow dev-tool .